Today I cooked a meal, and somehow it says so much about depression. Without further ado, let me first present the meal. 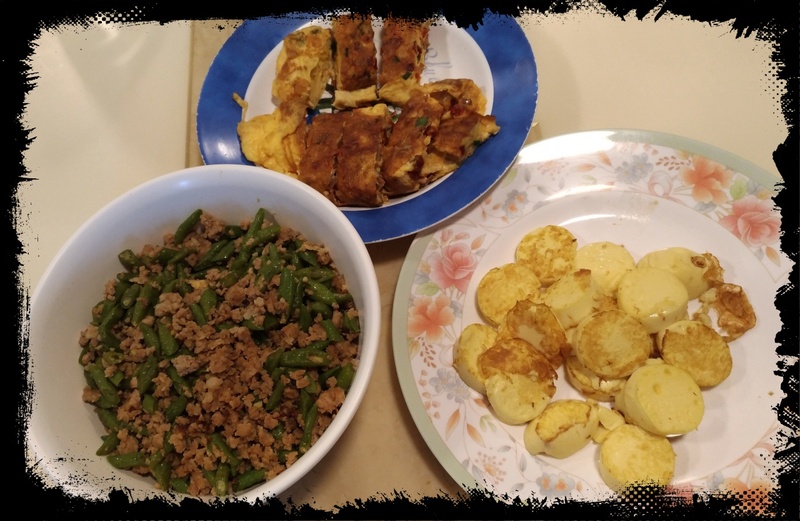 3 dishes, clockwise from bottom left – long beans stir-fried with minced pork, fried egg with char-siew and spring onions (otherwise known as egg foo young), and pan fried egg tofu. How can a meal like this say anything about depression? It was done on the spur of the moment. My wife had a prior engagement and so she wasn’t cooking, and I had to watch the boys when they came home from school. I felt tired but had enough energy to cook, or so I felt. So I decided to cook – and I didn’t know what to cook, but these thoughts came into my mind. I decided I could cope, especially because there were two familiar and easy dishes. Depression makes me look for familiarity, and new things are not easy to approach. But yet we really tend to live moment to moment, day by day, as it’s hard to plan and have ideas ahead of time. I pushed myself to do something unfamiliar, which was the egg foo young. However, I forgot to salt the egg, and when cooking, I turned the heat up too high, while I was stir frying the long beans. The result was a very brown omelette base when I tried to fold the egg. This resulted in a very chewy and underseasoned dish. Doing something new under time pressure made me forget basic stuff. The salt and heat control were basic steps I lost control of, which I may have done without depression. But similar mistakes are much more common in my daily life now, and sometimes start me on the spiral. A sign of improvement is that I am more able to pull myself out of the spiral before it begins. The familiarity of the other two dishes allowed me to accomplish them well, and is considered an achievement that I can report to my therapist (Cooking a meal for my family). Basic tasks become achievements. I have to readjust all my measures of accomplishment – what would have been a simple thing in the past now becomes a huge achievement to celebrate. The disaster of the egg foo young threw me off. I was quite upset by it, despite my wife’s constant reassurance that it wasn’t all that bad. Depression causes me to focus on the negatives. Even with the plates staring me in the face, it was an effort to tear myself away from the terrible egg. In fact, all that seemed to stare at me was the terrible egg. Nothing else seemed to matter on the table. My wife continued to reassure me, and ate up the egg without complaint, along with the rest of the dishes. Later, my boys would eat a little of the egg without complaint, and commend the long beans. Family support is very important for a sufferer. Not everyone is blessed with such support. In the same light, please remember to be gracious to your loved ones. Your appreciation for them shouldn’t start only in times of need, but should be there all the time. I’m thankful to God that I managed to cook this meal, and that the boys were fed. Though my wife was away, she’d set the boys their revision papers to do, and I only needed to help check their work. I also got given a “Get out of Jail Free” card – dinner for the boys is Macdonald’s. Oh well. You win some, you lose some. And I get a Samurai burger in the bargain!